Barefoot Angie Bee: The human foot. by the Substitute Blogger. The human foot. by the Substitute Blogger. Jaymon your substitute blogger here. Happy to have the opportunity to share a fascinating subject, the human foot. The foot is supremely deft at carrying the body about in a variety of gates and strides as well as facilitating climbing, crawling, swimming, kicking, jumping, height extension and aiding balance. The foot adapts to what ever demands we place on it. Having a history in martial arts I used my naked feet in ways most people do not often consider. From kicking above with the top, ball, heel, toes, and sides in striking to using them in grappling to hook, trip, push, and even strangle. Our feet have a lot of demands placed on them and they will adapt to whatever you want them to do but there are some special considerations one should apply to them. 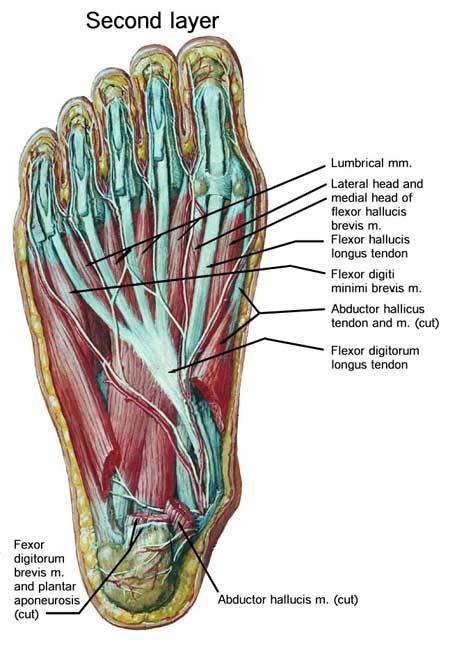 To understand these considerations lets first examine the structure and composition of the foot. Consider the foot as a combination of several dimensional variables of strength, durability, sensitivity, and finesse. All of these variables can be increased though some take time for the foot to adapt. 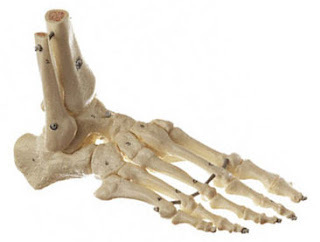 There are 26 bones connected through 33 joints in the human foot. These bones are very stout with lots of surface and knobby ends to connect more than 100 muscles and tendons to them. 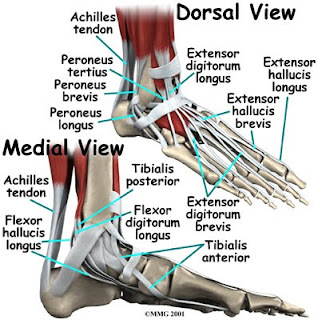 The movement of the foot including the toes is done through tendons leading to muscles in the lower leg. The foot. Just look at all that tendon. The muscles in the foot works to absorb impact rather than to articulate limbs. Tendons are slower to regenerate and strengthen in response to stress than muscle. Because the foot has such a large proportion of bone and tendon relative to other body parts it generally takes longer for it to become conditioned to new stress. Because the feet are so durable they will tolerate abuse through poor form longer than other body parts. This can lead to a false sense of progress in an endeavor until the foot finally gives in to injury and pain or worse injuries up the leg and body cause by the poor form. Feet are amazing and they will do whatever you want them to do. It can take a bit more time than other body parts so a steady incremental approach, special attention to good form and plenty of consideration for recent progress is called for. Wow, tons of foot info, thanks!! I wish I could see into my foot, like a special x-ray machine, to see what's going on with my heel. Beings it hurts more to walk on the hard concrete than it is to wear cushy shoes, I'd better stick to the shoes for now. But I am intrigued. This is an amazing post, its like as close to the exhibit "Body Works" as a blog could get! How do I know if I have good running form? Any videos online you can recommend? The basic tips are short stride, midfoot strike(do not strike your heel) upright posture with a relaxed upper body. Here is a barefooter showing his form. man, loving all the info. There always seems to be a common theme in people making the transition to being barefoot, they may want too much too fast. For most of us we have been wearing shoes for decades, it is naive to think that a few weeks or months of barefoot is going to reverse decades of atrophy. There are biofeedback based insoles out there that I would encourage people to insert into their 9 to 5 shoes or their minimal shoes to help speed up the transition. Another key thing to remember is that the second you put on your regular shoes on your are reversing all of the benefits you tried to achieve by being barefoot. Getting some insoles into your normal shoes, the one's you spend 90% of your time is a very smart thing to do. Your feet will thank you. Thanks for the useful post. Having the best running posture will help you run efficiently. I like how you described the human foot. I now understand the importance of every part of it and I'm glad about that. What will a medical specialist do for cracked heels?